Nexus Real Estate renews lease agreement Dutch head office Roche in Woerden for 8 years | Nexus Real Estate B.V.
April 2018 – Nexus Real Estate recently renewed the lease with Roche Nederland for 8 years for the “De Poort” building at the Beneluxlaan in Woerden. Roche leases approximately 3,857 sqm of office space, 42 parking spaces in the parking garage and 37 parking spaces on the outdoor parking area. Thi s extension of the lease agreement with Roche follows the previous signed short-term extension in 2016. In recent years, landlord has invested significantly in an improvement of the climate systems in the building. With this new agreement, parties have reconfirmed their long-term relationship. Roche is one of the foremost research-oriented healthcare companies in the world, with a combined force of both pharmacy and diagnostics. For more than 100 years, Roche has been active in discovering, developing and delivering innovative products and services for the early detection, prevention, diagnosis and treatment of diseases. The pharmaceutical division of Roche has been active in the Netherlands since 1968 and is located in Woerden. The approximately 190 employees of Roche Nederland are exclusively engaged in marketing, sales and clinical research. Over the years, the company has grown to become the largest hospital company in the country, thanks to the oncological portfolio. 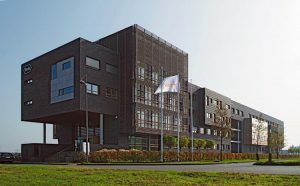 The “De Poort” building at the Beneluxlaan in Woerden is part of a larger real estate portfolio that has been managed by Nexus Real Estate since 2015. With this extension and the earlier extension of the agreement with tenant BBP Media in 2017, the future of the building will be guaranteed for the long term. Nexus Real Estate has realized this transaction on behalf of the owner of the building. Roche was advised by tenant advisor Solved.